The site is being turned into a hotel, but publican Louis Fitzgerald wanted to keep the beer garden open. A BID TO keep part of the famous Big Tree GAA haunt near Croke Park open on match days has been blocked by the local council. Louis Fitzgerald, the former owner of the pub, revealed earlier this year that the north Dublin joint had been sold to the Dublin Loft Company. Since the sale, the new owner has secured planning permission for a six-storey hotel at the site. Prior to the sale, the Big Tree was part of a wider pub empire controlled by Fitzgerald. The publican still owns several city centre venues, including Kehoe’s on South Anne Street and the Quays Bar in Temple Bar. 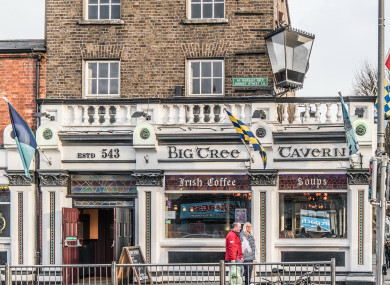 At the beginning of this month, the Big Tree opened its doors for the last time during All-Ireland football final day. However, earlier this summer and after the sale of the pub property, Fitzgerald applied for planning permission to erect a marquee with bar facilities in a courtyard beside the pub on Croke Park match days. In his application to Dublin council, Fitzgerald’s firm noted it has erected a marquee on the site for the past six years and the venue “has become a major part of the social aspect of the Croke Park experience”. The proposed site for the summer marquee is currently on Dublin council’s vacant sites register, a State scheme that imposes a levy on disused property that could be developed for housing. According to the register, the owner of the €1.3 million property is the Dublin Loft Company. Fitzgerald previously received permission from the local authority for a marquee development at the site in 2016. However, local residents lodged complaints against the latest application. The Mountjoy Square Society said that the pub owner has not used the previous permission to erect a marquee and instead used the area as a “large open-air beer garden”, which included two bars, portaloos and a burger van. “The noise of hundreds of people drinking in the beer garden has a serious impact on the amenity of the houses of Belvedere Road and North Circular Road. There are also extreme smells from the burger van,” the group said. The residents group added that the planning permission granting the Big Tree use of the space expired in April and the site had been used on numerous occasions since then a beer garden. In its decision on the application, Dublin council refused Fitzgerald planning permission due to the disturbance the development would cause the residential area. Email “A bid to keep GAA fan haunt the Big Tree serving on match days has been blocked”. Feedback on “A bid to keep GAA fan haunt the Big Tree serving on match days has been blocked”.